The Government Office of the Republic of Slovenia for Development and European Cohesion Policy, Kotnikova 5, 1000 Ljubljana, represented by the European Territorial Cooperation and Financial Mechanisms Office, Cross-border Programmes Management Division acts as the Managing Authority. The Managing Authority is the contracting authority for the European Regional Development Fund (ERDF). - Cooperation Programme Interreg V-A Slovenia – Austria No CCI 2014TC16RFCB054, approved by the European Commission Decision, No C (2015) 6470 on 16 September 2015 with all amendments. This Open Call for Proposals is issued by the Managing Authority and is applicable for applicants defined in point 7 of this document. 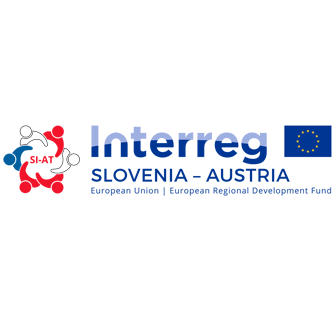 The Cooperation Programme (CP) Interreg V-A Slovenia-Austria (Interreg SI-AT) for the programme period 2014-2020 invites beneficiaries of the individual investment priority established in the programme area to submit applications in the frame of this Open Call for Proposals. The Application Pack, consisting of the Implementation Manual for Beneficiaries, the templates of the Lead Partner Statement, Project Partner Statement, sample of the Subsidy Contract, sample of the Partnership Agreement and the Cooperation Programme Interreg V-A Slovenia-Austria is available for download on the web page www.si-at.eu. to ensure the harmonious development of participating cross-border (CB) regions and to enable all citizens to make the best use of given natural conditions and opportunities, taking into account the specifics of each part of the programme area.  Specific objective 1: Strengthening R&I in technological and economic fields of strength through CB cooperation of relevant stakeholders.  Specific objective 2: Broadening the basis of innovating enterprises in the programme area. Projects have to apply a result-oriented approach. The coherence of the project intervention logic (i.e. the project specific objectives, activities, outputs and expected results) with the targeted specific objective of the programme needs to be clearly demonstrated. For detailed information on the description of the content of each Priority Axis and programme specific objectives, including the possible actions, beneficiaries and target groups, please refer to section 2 of the CP Interreg SI-AT document. In order to make your project compliant with the Programme it is compulsory to read and take into account the description under each Priority Axis and corresponding specific objective. Under the terms of this Call, a project proposal must refer only to one of the mentioned Priority Axes and one programme specific objective, even in case of a project where some activities might also fall under the other Priority Axis. Activities have to indicate cross-border impact on the eligible area of this Programme. At least three of the cross border cooperation criteria must be fulfilled (joint development, joint implementation, joint staffing, and joint financing). The Project Partners shall cooperate in the project development and project implementation. In addition, they shall cooperate in the financing or the staffing. The amount of 44,988,355 EUR from the European Regional Development Fund will be available for co-financing projects. Only eligible expenditure can be co-financed from the Programme, whereby the Community co- financing from the ERDF funds can amount to max. 85% of the total eligible costs; at least 15% is to be ensured from other sources1. The projects eligible for participation in the Programme have to apply for at least 50,000 EUR of ERDF funds and as recommendation should not apply for more than 3 million EUR ERDF funds.  Private and public business support institutions (incubators, technology parks, science parks, competence centres, business support centres).  Clusters and networks (including clusters and networks of SMEs).  Tourism institutions, associations and agencies.  Universities and other academic and higher education institutions as well as technology and business oriented high schools.  Training and education organisations and institutions.  Institutions and organisations representing economic and social interests of employees/employers.  National, local and regional (public) authorities.  Local/regional institutions, development organisations and networks.  Local, regional and national authorities and organisations (e.g. ministries, local communities, public institutes and services).  Institutions, organisations, associations and NGOs in the field of nature protection and conservation, environment, spatial planning, public transport, culture and tourism.  Institutions and organisations in the field of water management, nature protection, environment and risk prevention, spatial planning and other research organizations.  Associations and NGOs in the field of water, nature protection, bio/geodiversity and environment.  Local and regional public and state administrations.  Other types of public and private organizations/institutions interested in CB cooperation (e.g. training and educational institutions, institutions and organizations in the field of risk management, health, energy, qualification and labour market, NGOs and associations of socially excluded, associations for children, etc.). The minimum requirement is to have at least one Project Partner from Slovenia and one from Austria or an EGTC (European Grouping of Territorial Cooperation) registrated in one of the participating countries, consisting of members from both Member States. The Lead Partners must be located in the programme area. Institutions located outside the programme area, but inside the European Union can only act as Project Partners. Applicants located outside the programme area but inside the European Union can become Project Partners only in duly justified cases. Please note that, in case of project approval, the effective participation of partners from EU regions outside the programme area is subject to the condition that the Member States where they are located accept all of the implementing provisions in relation to management, control and audit. The earliest possible start of the project is the date of the submission of the application in the electronic Monitoring System (eMS). The project end date is the date defined in the Subsidy Contract, but not later than 31 December 2022. The recommended project duration is up to 36 months. A detailed description of the eligible costs is included in the Implementation Manual for Beneficiaries (Part 4). Expenditure can be considered to be eligible at the earliest from the date of the submission of the project proposal in the eMS system. Applicants should read all the documents related to the Open Call for Proposals before project submission. In the course of the Open Call for Proposals, questions may be sent by e-mail to Joint Secretariat (JS).  information about the Programme and the Open Call for Proposals;  information concerning preparation and submission of applications. Support concerning specific project content related topics, including information on State aid and Project Partners search will be provided by the representatives of both Member states (National and Regional Authorities). It is strongly recommended that all Project Partners contact their National/Regional Authorities, prior to submission of the Application. Contacts are listed in Part 2, chapter 2.1 of the Implementation Manual for Beneficiaries and on the programme website. The information on the planned informative workshops and most frequently asked questions will be available on the web site www.si-at.eu. The application can be submitted at any time between the launch date and the closing date of the Open Call for Proposals or as long as the funds are available. The project applications can be submitted continuously after opening the Call. The first deadline for the submission is 12 February 2016. The following deadlines for the submission of the applications, will be published on the Programme web site www.si-at.eu at least two months before the set deadline. Applications received in due time before each Monitoring Committee (MC) and fulfilling all requirements will be subject to MC decision. The application must be submitted by the Lead Partner solely through the eMS system. The submitted application must contain all the required data and the signed scanned annexes to the Application Form as stated in the Implementation Manual for Beneficiaries. The Application Pack is available at the web site www.si-at.eu. The selection of projects is based on the assessment of the received applications following a standardized procedure, which safeguards the principles of transparency and equal treatment. Only valid is the Application submitted via eMS system. The administrative and eligibility criteria have to be fulfilled by every project proposal. Those applications that fully comply with the administrative and eligibility criteria will be subject to the quality assessment. If there are some discrepancies or some documents are missing according to the administrative check, the application will be rejected in the eMS system as administratively not eligible without any request for clarification or supplements. The applicants have the possibility to submit the revised application again till one of the next deadlines. Total available points within the quality assessment are 98 (100%). Each project has to score at least 60% or 59 points. Projects not reaching 59 points will be rejected. Projects reaching 59 - 73 points will be discussed on the MC meeting with the possibility of being postponed or rejected, projects reaching 74 points (75%) and more will be discussed on the MC meeting with the possibility of being approved, postponed, rejected or put on the reserve list. The detailed description on the scoring within the assessment is provided in Part 3, Chapter 1.5.1 of the Implementation Manual for Beneficiaries, which is part of the Application pack. Projects on which the MC will decide to be rejected after the quality assessment, may not apply for Interreg SI-AT funds again with the same project idea and partnership. The final decision on the project is made by the MC of the CP Interreg SI-AT. The MC formally decides on the approval or rejection of the projects and on the ERDF contribution by talking into consideration the quality of projects and contribution to the Programme objectives. On the basis of the decision of the MC, the Lead Partner will be informed by the Managing Authority on the approval/postponement/rejection/being put on the reserve list of the application within 30 calendar days of the decision of the MC. Should the Open Call for Proposals or its Application Pack be amended corrigendum will be published on the following web site: www.si-at.eu. Amendments of this Open Call for Proposals shall be published in the Official Journal of the Republic of Slovenia. Applicants are obliged to respect eventual amendments to the Open Call for Proposals and its Application Pack published in the manner as described above. The Open Call for Proposals and the Application Pack are published in Slovene, German and English language. In case of discrepancies between the Slovene and the German text of the Open Call for Proposals and the Application Pack, harmonized English version will be used as a tool for common understanding. The application must be submitted bilingual, in Slovene and German language, except the Summary of the project which needs to be submitted in Slovene, German and English language. In case of discrepancies, the language of the Lead Partner prevails. The applicants must make sure that the wording in Slovene and German language is the same and understandable. The results of the Open Call for Proposals are information of public nature and will be published on the web site www.si-at.eu after signing the ERDF Subsidy Contracts with the selected Lead Partners.